This is the first in three installments of an in-depth look at the future of design education… the designer as social entrepreneur. Designers are best known for their adept ability to communicate provocatively through form (products, printed ephemera, and interfaces on screen), however we are also fairly quite successful at thinking beyond these more well known outcomes. The unknown is what the designer approaches daily. We are faced with creating unique solutions where failure happens many times in the design process as we attempt to find a creative solution. 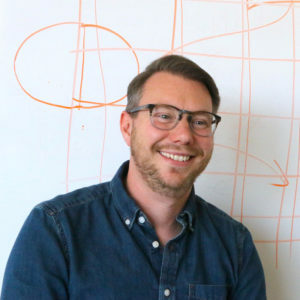 Dees says, “Entrepreneurs tend to have a high tolerance for ambiguity and learn how to manage risks for themselves and others.” He further says,“Where others see problems, social entrepreneurs see opportunity. How can we surmount this obstacle? How can we make this work?” This is how the designer works which makes us perfectly suited to embrace social entrepreneurship.We are an inherently interdisciplinary profession that continually evolves through our interaction with clients and the use of new technologies. We are also extremely visually literate with the ability to provide great universal insight into a creation process to reach different economic sectors and connected cultures. Our abilities to connect with, work with and inspire various people make us a perfect discipline to move increasingly towards social entrepreneurship. My EDGE (Ethics of a Designer in a Global Economy) course that just finished up last week (May 4, 2011) explored the designer as a social entrepreneur through three projects. The first project was a week long “M Blitz” conducted by Professor Bernard Canniffe from Minneapolis College of Art + Design and Piece Studio. Bernard asked the group of 15 graphic designers and 1 economist to “Think Wrong” about what design is and challenged the structure of the design education model. The students, in order to encourage them to think about design outside of posters, were put through a number of exercises that took them out of the classroom and most importantly their comfort zone. The standard three-hour class block became a full 24- hour-a-day immersion into the world of a Social Designer. 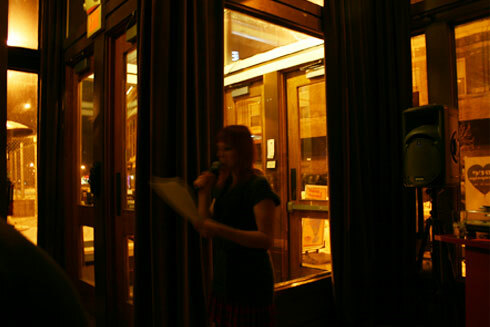 The results of the students’ research were presented in crazy ways (we performed skits at a local bar). Bernard pushed the students to gather ten stories from 10 different members of the community each. They discovered that the local community was fractured from the University community and needed to feel connected and most importantly be “listened to.” It in many ways was a startling awakening for many students who looked at their University experience as only connected to campus, when in fact, it also was intrinsically intertwined with the many cultures of the local town. 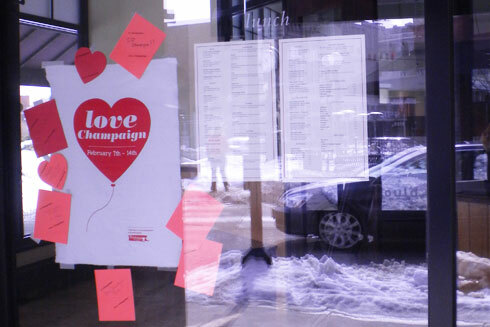 Through social media, some well-placed snowbank messaging, and valentines hung around the town confessing one’s love for the town, the students were featured on the radio (two times) and the local morning news. They were able to create four events in the downtown that enabled members of both the university and town to interact and share their needs and lives. 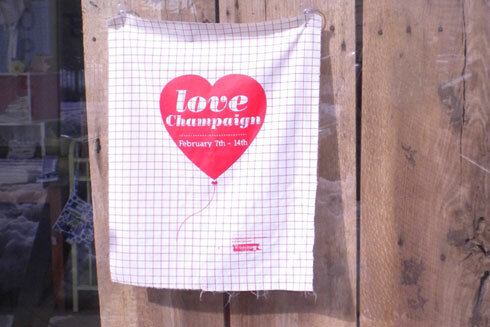 “Love Champaign” was successful in many ways (and failed in others). It, most importantly, happened. In just one week, one class began the long process of re-connecting a fractured community. We had discussed at length what success would mean for us. We felt starting the discussion from a group that typically didn’t care about the town (Students) would encourage the community to take over the project in the future. That would be satisfying and a great example of social entrepreneurship that was sustainable. Secondly, the class realized that design is much more powerful than a poster. Thirdly, if the student is allowed to aid in the project outcomes, as opposed to just being told what to make, that the results are provocative. Thinking should not be such a dangerous idea. Lastly, asking the designers to place themselves out in the world, and remove themselves from the studio provides the stimulation needed to create truly valuable and informed solutions. The days of the designer isolated in his/her studio are over. The world is too much in need of some good ole TLC, that it’s going to take a community to solve. Not all the results were 100% positive however. Despite the excitement, press and meaningful solutions, the community didn’t engage in the discussion as much as the class hoped. Maybe it was the frigid temperatures? Or possibly the three-four foot snow banks prevented travel downtown? 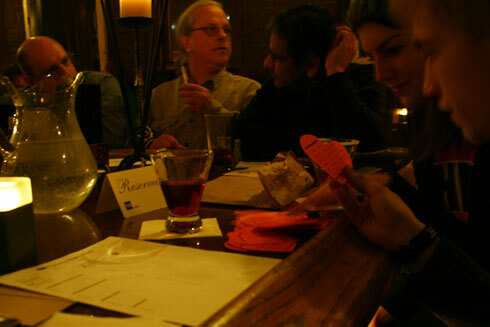 We also felt that events were too early in the evening or on the wrong days of the week to get the most attendance. It is probably the case that many of these scenarios all happened, and even more likely that the people we needed to connect with didn’t use social media. The first project was the catalyst to continue to build the comfort for the students that social entrepreneurship was a perfect match for the designer. The next two projects increasingly added to the conversation with invited guests and readings. These two projects will be explored in two separate articles starting next week.